A memorial service celebrating the life of Professor Emeritus of Chemistry and former Robert McMillen Professor of Chemistry Robert Rosenberg will be held Saturday, June 20 at 1 p.m. in the Nathan Marsh Pusey Room of the Warch Campus Center. Rosenberg died April 3 in Milwaukee at the age of 89. 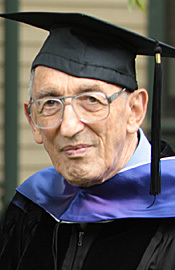 Professor Emeritus of Chemistry Robert Rosenberg, 1926-2015. Rosenberg’s son, Charlie, will deliver a eulogy while his daughter and grandchildren will share family memories. Alumni and colleagues will offer reminiscences and musical preludes will feature some of Rosenberg’s favorite songs. One of Lawrence’s most distinguished teachers, Rosenberg spent 35 years on the Lawrence faculty (1956-91). His work on the physical chemistry of proteins and chemical thermodynamics was supported by grants from the National Institute of Health, the National Science Foundation and Research Corporation. Well known and highly respected for being unfailingly courteous, Rosenberg encouraged his students to learn chemistry, often by designing their own experiments, gently leading and probing them to think creatively. He responded to their questions by asking more questions in turn to hone their analytical skills. His clear, patient explanations of equations describing complex physiochemical phenomena became legendary. One of his students, Thomas Steitz, went on to win the Nobel Prize in Chemistry in 2009, an event Rosenberg said at the time had him “walking on air” with pride. He was preceded in death by his wife, Virginia in 2013, and a son, James in 1994. He is survived by a son, Charles, Milwaukee, a daughter, Margaret (Eric) Wilde, Bronx, N.Y., and two grandchildren, Emma Wilde and Nathaniel Wilde. The family has suggested memorial donations can be made in Rosenberg’s name to Lawrence University, the Nature Conservancy for the Fight for $15 campaign for fast food workers. Read more about Rosenberg’s life and career. Chemistry Professor Robert Rosenberg spent 35 years on the Lawrence faculty. One of Lawrence’s most distinguished teachers, Professor Emeritus of Chemistry and former Robert McMillen Professor of Chemistry Robert Rosenberg, died Friday, April 3 in Milwaukee. He was 89. 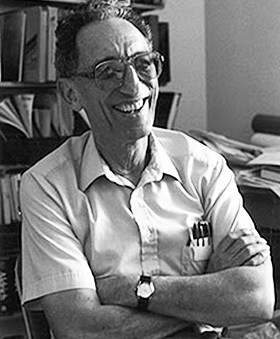 Rosenberg spent 35 years on the Lawrence faculty (1956-91), specializing in physical chemistry of proteins and chemical thermodynamics. His research was supported by grants from National Institutes of Health, the National Science Foundation and Research Corporation. He was the author of the book “Principles of Physical Chemistry,” which was published by Oxford University Press, and co-author of the third and subsequent editions of “Chemical Thermodynamics,” originally authored by one of his Ph.D program professors at Northwestern, Theodore Klotz. In retirement, he wrote “Why Ice Is Slippery” for Physics Today, which proved to be his most popular work, quoted in a New York Times article, and in the Weekly Reader, while the original article was translated into Italian and Japanese. In conjunction with former physics professor Bruce Brackenridge, Rosenberg created the novel course “The Principles of Physics and Chemistry,” a mathematically rigorous, calculus-based introduction to both physics and chemistry, spread over all three terms, that they taught collaboratively. They also co-authored a textbook of the same title. Rosenberg’s scholarly interests extended beyond the laboratory into the arenas of societal concerns through public seminars on nuclear disarmament and environmental issues. Well known and highly respected for being unfailingly courteous, Rosenberg encouraged his students to learn chemistry by often designing their own experiments, gently leading and probing them to think creatively, frequently responding to their questions by asking questions in return to hone their analytical skills. His clear, patient explanations of equations describing complex physiochemical phenomena became legendary. 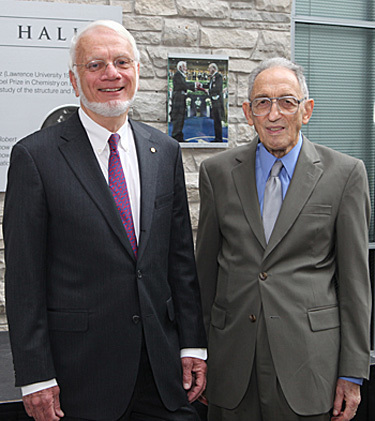 2009 Nobel Prize winner Thomas Steitz (left) was a protege of long-time Lawrence chemistry professor Robert Rosenberg. One of his students, Thomas Steitz, went on to win the Nobel Prize in Chemistry in 2009, a development Rosenberg said at the time had him “walking on air” with pride. 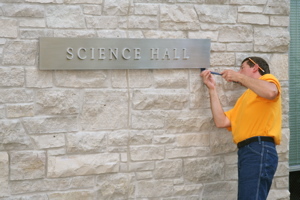 His commitment to his students often extended well past their graduation, remaining an active mentor during the careers of many chemistry alumni. He enjoyed reconnecting with former students during Reunion Weekend. During his last two years, many former students wrote or came to visit, crediting him as a foundational influence in a number of distinguished careers. Born in Hartford, Conn., Rosenberg earned his bachelor’s degree from Trinity College and his Ph.D. from Northwestern University. He spent time as a research associate at Catholic University of America and taught at Harvard University Medical School and Wesleyan University before joining the Lawrence faculty in 1956. During his tenure at Lawrence, Rosenberg spent a year as an NSF Fellow at Oxford University and served as director of the ACM program at the Argonne National Laboratory for a year. After his retirement in 1991, he spent several years as an adjunct professor of chemistry at Northwestern University, where he organized a well received symposium in honor of Professor Klotz. A memorial service celebrating Rosenberg’s life will be held at Lawrence later this spring on a day and time to be determined. In lieu of flowers, the family has suggested memorial donations can be made in Rosenberg’s name to Lawrence University, Northwestern University or the Nature Conservancy.